Rewards Canada: April 21 Update: 5 Great Marriott Hotels in Canada update, Why aren't you using a rewards credit card and more! 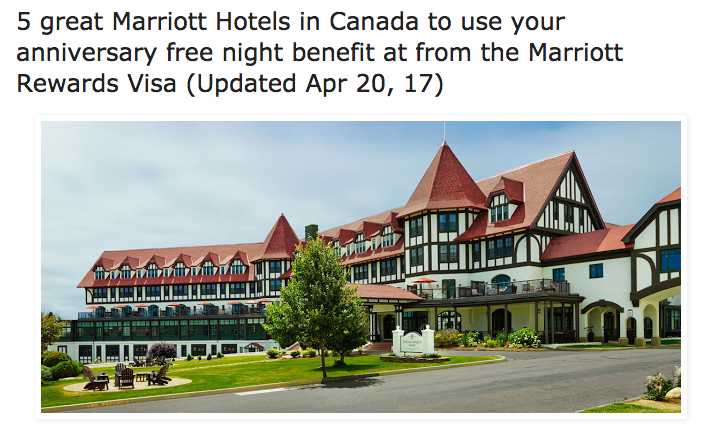 April 21 Update: 5 Great Marriott Hotels in Canada update, Why aren't you using a rewards credit card and more! We updated our very popular post on 5 great Marriott Hotels in Canada to use your Category 1-5 Free Night certificate from the Marriott Credit Card at. We have to remove the Delta Kingston since in jumped to Category 6. See what we replaced it with here! We released another new feature article today entitled Why aren't you using a rewards credit card? There are only two types of people who shouldn't be and in one of them are just missing out. Read the article here! KLM has brought back their amazing business class sale for flights from Canada to Europe and beyond! You can fly in style for as little as $2,789 all in! Simply book by May 3 for travel ALL SUMMER! Find out more and book here.